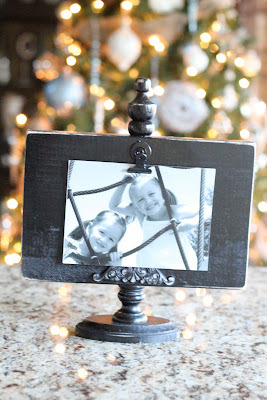 Shanty2Chic: Cheap but Chic Christmas Gift! 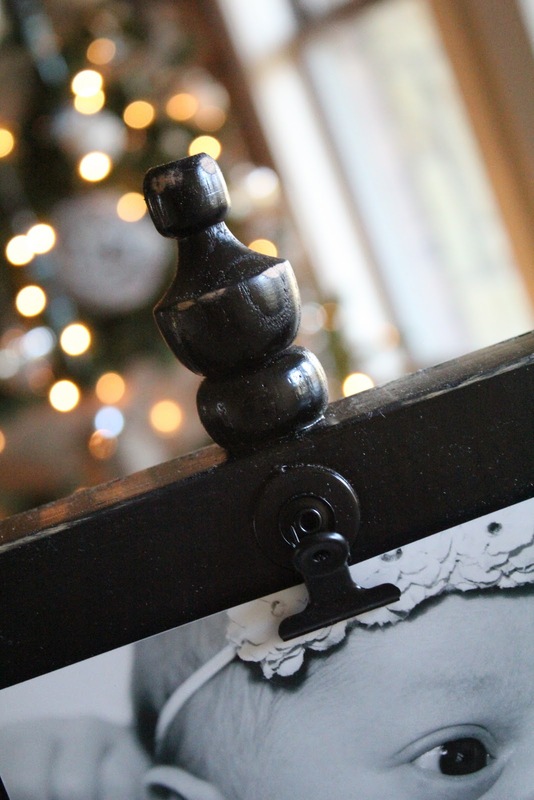 Cheap but Chic Christmas Gift! We were so excited that our sweet friend Kari asked us to come play over at her blog this week!! The theme of the week is right up our alley! 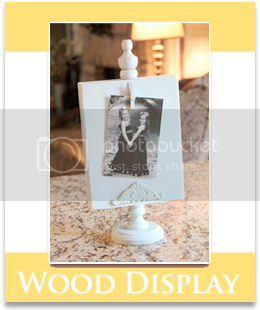 It's a super simple photo, recipe or memo display! All of these supplies can be found at craft stores and hardware stores. You will start with some wood ovals and a bag of small candlesticks. I got mine from Hobby Lobby. The wood ovals were $.50 a piece and the candlesticks were $2.99 for the bag. I used e6000 to attach a candlestick to one of my ovals. For my big piece I used a 2x8x8 from Lowe's. Home Depot will cut it down for you if you don't want to purchase the whole piece. I cut my wood in 11" pieces to use for these. If you don't have a saw just have Home Depot cut it for you when you buy it... Easy! I bought these cute scrollies (professional term) from Hobby Lobby to add a little detail. They were $1.99 for a package of 2. I used my glue to attach it to the bottom of the wood. I made two displays going different directions so I could show you both. I added some e6000 to the now dry candlestick and attached the large wood piece to it. I found these great finials at Lowe's. I love them and use them on LOTS. They are $1.86 for 2. I drilled a small hole in the top of the wood. You don't have to drill a hole but it does make this part much faster! 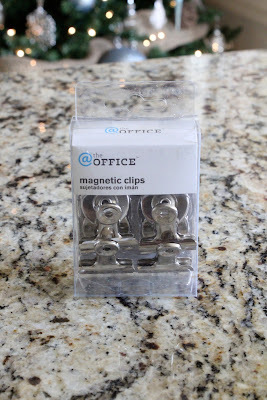 I found these clips at Walmart. They are $1.88 for a pack of 4. And stuck it to my display. Here they are ready for some spray paint. I sprayed both displays with Rust-Oleum Painter's Touch. I used Heirloom White on one and Canyon Black on the other. After they were dry I used my sanding block to shanty the edges up a bit! Here is how they turned out! Hope you like them! They are fun, easy and best of all CHEAP! If you want to make these for just $5 a piece you need to make 4 of them. Because the supplies come in bags and groups that is the best way to get more bang for your buck! I will be giving mine to my kids teachers this year. My mom is my neighbor so she may just get one too! Thanks Miss Kari for having us! Very cute and clever, it's a double whammy! once again, you guys make something so amazing like this! CUTE! I will totally try that!! By the way...I have looked for the finials at Lowe's at couldn't find them. Where exactly did you look in the store? These are fantastic! Love them. I'm going to make some and link back to you. Thanks for the inspiration! These are absolutely adorable!!! Can't wait to get busy on making these for gifts!! 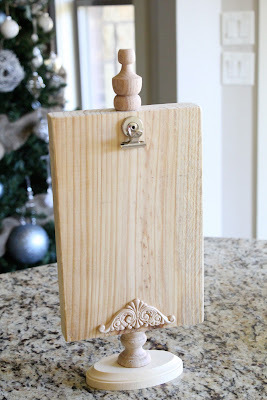 This project is so clever and classic looking - you guys always come up with great stuff using unpainted craft wood pieces. These are so cute! Great idea for all those teachers. I might make some for them and the babysitter too. She would love it painted light pink. I love this gift idea! So unique an sooo adorable. Thanks for sharing. This is such a nice gift idea, thank you! I have made something similiar to these. I used Metal Sheeting from a local hardware store. This is a magnetic sheet so you can use magnets to hold your recipes, pictures or notes. Just use upholstery tacks to secure. I love this idea!! I bought a ruffler foot!! It is AMAZING!! I have post coming up about it. I too would like to know what area of Lowe's you found those finials. I couldn't find them! Thats so easy! A clever way of showing creativity with in the margin of budget. I would love to try that one! Love your blog! OMGosh! Those are so cute! Wish we had a Hobby Lobby close - even in the same state would be nice! I'm going to try to craft-lift this idea for my "friends & neighbor" gift...hope I can find all the stuff...thanks so much for sharing! Love these! They would make great gifts for anyone, especially since they are handmade. Thanks for sharing the tutorial! My sister and I were looking for a gift to make our friends for Christmas, and I think you gave us exactly what we were looking for! I love this! I think I'll make some for sister-in-law gifts. Thank you! Very cute.. that would look good with my Christmas card attached. Thanks for the idea! This is such a great idea! 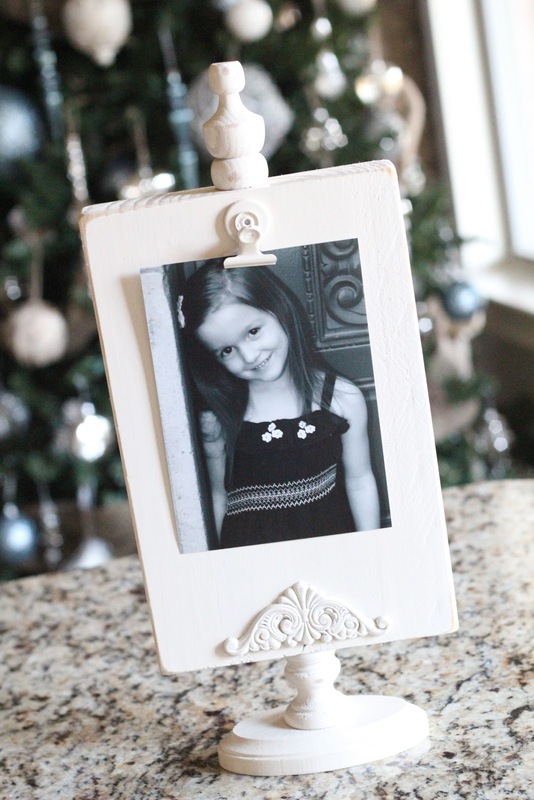 I was looking for a great picture frame idea for pictures of my daughter for the Grandparents that wasn't just a boring old picture frame! I already bought the materials the only thing that's killing me is those wooden appliques! No one has them and I don't have a hobby lobby!! :( Thanks for the great Idea, I'm going to make some decorative appliques from Lowe's work tho I think they're too big and the pictures will go over them. You guys are so creative over here I LOVE your posts! I love this idea! I want to make some for friends! I love it!!! I featured you on my blog today!!! 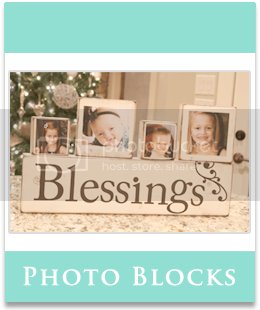 Also, Whitney...I'm in the process of making these and feel like the wood block is totally overwhelming. I know I did the exact size you said but just wondering if you felt that way too until you got them all done. Just wondering. I'm contemplating cutting it down from 11" to like 9 1/2" or something. Thanks! Thanks for the heads up on the scrollies! Mine are 11". I think it's just a taste preference. If you feel they are too big, just cut them down. I bet they would look great smaller too. Let me know if you have any other questions :-)! I absolutely love this project. My sisters and I make homemade gifts for one another every Christmas. I have to make this form them. They would love it!!! Thank you for sharing your creative idea!!! Adorable idea!! 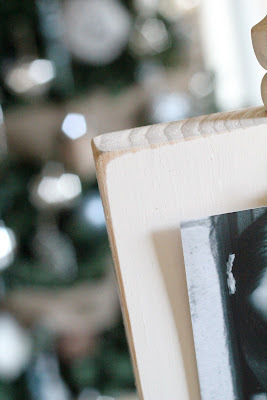 I featured this over at my Christmas party at Sassy Sites! Come by and check it out! I LOVE this--thanks for sharing! I am so in love with this project idea!! It's a perfect grandparent gift. I know what I'm doing tomorrow! 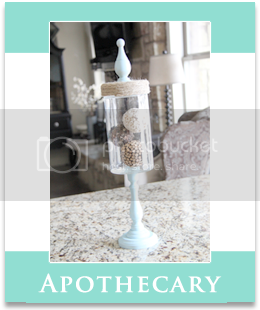 These would also be neat in the kitchen as recipe card holders. So many neat uses. Thanks for another great idea. it was actually for this frame. I love it and am in the process of making them for Christmas presents! Where exactly did you get the finials for the top? What a great project, thanks for the idea! I am trying to do these, but I'm having the hardest time finding the finials. I've tried 2 different Lowe's. Where exactly are they in Lowe's?? Thanks so much!! I too am desperately seeking the FINIALS! I have searched online. I have done a barcode search. It's gorgeous! It's going to be my sister in law gift. They don't like me so much, so maybe I can WOW them LOL! These are so cute! I am having a hard time as well trying to find the finials. I have tried every Lowes in the state. Can you tell me where in Lowes you got them. I found the finials at my lowes with their other decorative wood pieces. Same aisle as the fence post pieces you can make candle stands from! Sorry Im not more help! I just pulled up the blog on my phone and showed a Lowe's worker (in building materials area) what I was looking for. She took me right to the spot! Those picture displays are just too cute. How do you come up with such great ideas? Thank you SO much!! I LOVE this idea, and just went out and got the supplies tonight!! The finials are in the lumber department (at my Lowe's), with all the scroll work. They come in 3 sizes, but I was surprised at how big the small ones are! They look GREAT though!!! 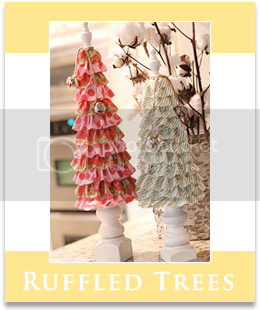 Instead of the little scroll "thingies" we found little snowflakes and beveled wood pieces at Jo-ann's! I LOVE how they look and can't wait to spray-paint them tomorrow!!! You have the best ideas ever!!! I finally got all of my supplies and am in the middle of making 16 of these. I am making these for all of my daycare parents for Christmas!! Thanks so much for sharing!!! I totally tried to copy this! Yours turned out way better, but then--I was going the super duper-schmooper cheap route! Thanks for the inspiration! Awesome, fantastic, totally original! Thanks for sharing. Fantastic idea, simple and lovely...and one I might just have to give a try with. THanks for sharing. Thanks for sharing the great idea. I made them for Christmas gifts. 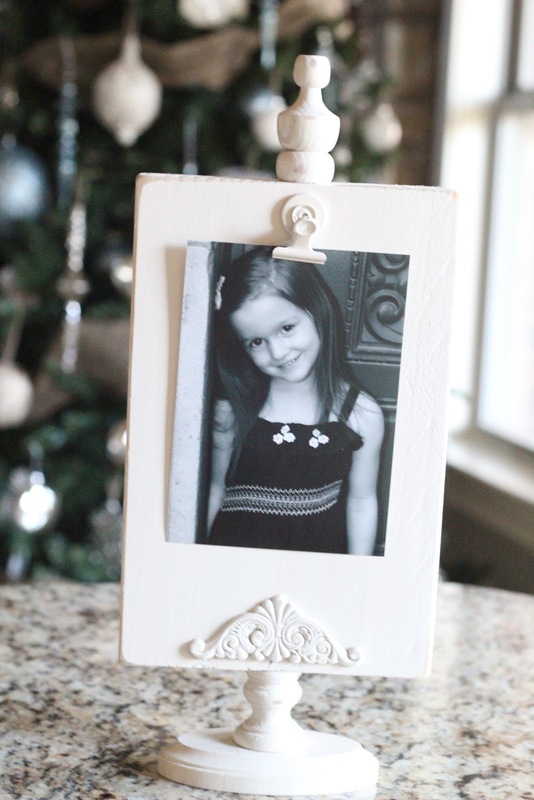 I have given one set (tall black, wide white) and they were a big hit! Thanks again! you are genius!! these are so great! Came from Restored Interiors. 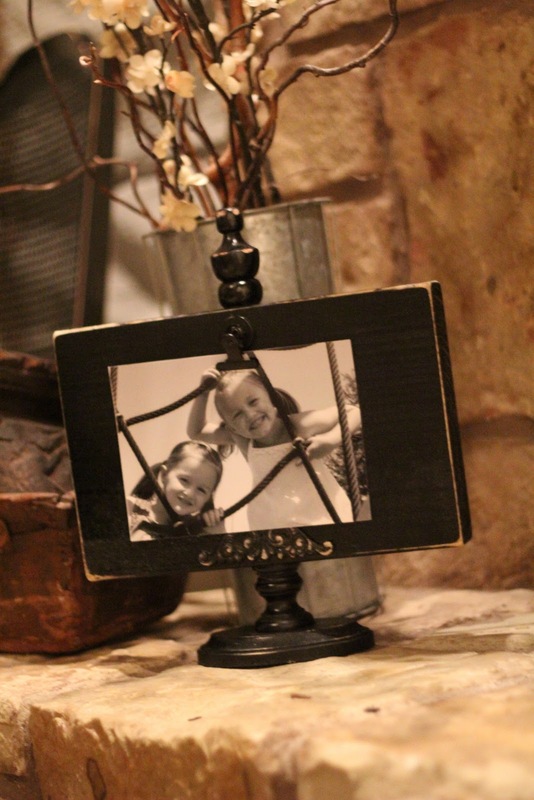 These frames are FABULOUS! I am your newest follower!